Apple is once again offering the iPhone SE on its clearance site, making the now-discontinued device available for $249 to $299. You can purchase the 32GB iPhone SE in Gold, Space Gray, Silver, or Rose Gold for $249, and the 128GB iPhone SE is also available for $299 in all colors. Apple originally discontinued the iPhone SE in September 2018 when the iPhone XS, XS Max, and XR were announced. Apple's iPhone lineup now starts with the iPhone 7 and 7 Plus as its entry level devices. The iPhone SE, first announced in March 2016, was the last 4-inch smartphone that Apple offered, with the 4.7-inch iPhone 7 and iPhone 8 models now the smallest that Apple officially sells in retail stores. 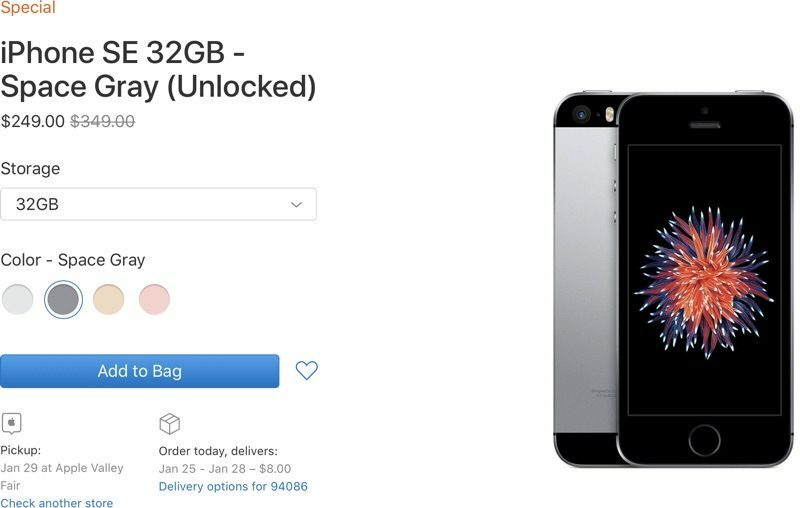 Apple added discounted iPhone SE models to its clearance store on January 19, but available stock quickly sold out. Apple refreshed the store this afternoon to add additional supply, though what's in stock now could also potentially sell out quickly. We don't know for sure why Apple is selling the iPhone SE again, but it's likely that Apple is clearing out remaining iPhone SE stock. In 2018, there were rumors suggesting Apple was working on an iPhone SE 2, but in hindsight, some of the rumors were conflated with iPhone XR rumors and no second-generation 4-inch device materialized. Apple analyst Ming-Chi Kuo, who often provides accurate insight into Apple's plans, said in early 2018 that an iPhone SE 2 was unlikely, and other analysts have also suggested Apple no longer has plans to produce a new 4-inch model. Was issued a SE for work. Horrible phone, so small it’s like a little toy. The SE is the best phone they've ever made (for me). Their latest range are like massive tablet toys. Tim Cook is a fool for abandoning the small form factor iPhone, there is clearly a sizeable demand for it. I really want to buy the 128GB Space Grey model, but I can't justify it as I would rarely use it, but that's a great phone and a great deal. It's obvious that Apple needs to replace the SE with updated internals and cameras at the very least. Hell, keep the same form factor, but put the A11 or even A12, at least iPhone 8 camera, and Touch ID 2 solid state home button from the iPhone 7/8. Oh, and offer the Black form the iPhone 7 and bring on Product Red. Watch your iPhone sales increase Apple. Apple's greed is getting in the way of their brain. Give people the option for a smaller device. Many will buy it. Have a small medium and large model. How simple is that? I just don’t understand how so many people, particularly men, seem to prefer larger sized phones than the SE. I am a tall and big guy and phones larger than the SE just seem way to big. An SE is as large a phone as I find comfortable in my pocket. I can’t imagine I am that much of a minority, but maybe I am. Regardless, I’ll hold onto my SE as long as I can unless Apple makes a new or updated phone the same size. I'm so tempted to buy one to stash away in case mine ever up and dies but I'm hopeful that by the time that happens Apple will have a new 4" model available for purchase.